Thelma Chalifoux, seated in the middle. Image courtesy of Sharon Morin. Our mothers are more than just a physical person, just as our houses are more than just a structure to live in; our mothers and our homes are an all encompassing presence, they are beings and spaces deeply rooted in our personal consciousness. In the same way that our homes are a safe haven, our mothers are a physical space to hold our stories, to carry the heaviness of our lives, to shelter our tender existence with their mere presence. In celebration of the power and grace of motherhood, it is an honour to share with you the life story and wisdom of Thelma Chalifoux, Métis matriarch. Thelma Chalifoux was born mid-winter of 1929, in Calgary. The first year of her life was marked by both flood and famine; in June the Bow and Elbow Rivers burst their banks immersing the community in a deluge of water, dams and bridges were washed away by the heaviest rains the area had seen in decades. Later that year, the nation’s financial institutions failed to keep their stocks afloat, thereby causing the economy to plummet. In these unsteady times, Thelma’s parents were a bedrock force, setting the groundwork for Thelma’s greatness. As a child of the Depression, Thelma’s first decade was one of both scarcity and abundance, as the world around her tightened its proverbial purse strings, she was shown the value of cooperation and community, sacrifice and solidarity. Upon this foundation, a truly incredible woman was built; a Métis matriarch who has brightened the world and served all people by standing up for children, women, the elderly, families and the larger Métis nation. Just as a house has walls, windows and floors to hold it steady and upright through time, no matter the weather, no matter the forces that may press against its pillars, Thelma’s parents built within her an adaptability and graciousness that continues to this day. Thelma Chalifoux and Children, c. 1958. Image courtesy of Sharon Morin. Our Mothers are a center point, a guiding light and a vessel upon which we may endlessly draw strength, wisdom and a sense of rightness. Thelma’s mother, Helené, grew a huge garden and canned every ounce of its abundance to put up for later or to trade. Although it was illegal at the time for ‘Indians’ to take part in commercial activities, Helené would swap whatever extra vegetables she had with local First Nation families who had access to game animals. The door of Thelma’s childhood home was always open, as were the hearts and minds of her parents, no matter the sensibilities of the day, their hearth was a place of friendship and warmth. Thelma’s father, Paul, was a skilled carpenter, a horse whisperer, ranch hand and labourer. He attended residential school as a child and had fought in the First World War, managing to make it home from both. He is described by Thelma as her hero and best friend. No doubt, his immeasurable dedication to his family was shown in his ability to strike a balance between necessity and his own need to be close to his children as the Depression sent him far afield to work. From Helené, Thelma received the gifts of independence and fearlessness. From Paul, she was gifted a sense of belonging and the knowledge that she was deeply loved. These treasures are now shared with Thelma’s 8 children, 32 grandchildren, 34 great grandchildren and 4 great-great grandchildren. It is a legacy of love and the mark of her true greatness as a Métis matriarch. Thelma’s family was considered small for that era, she had two sisters and two brothers. Her fondest childhood memories are of farm life, cattle drives and horses, and warm summer days spent with her family at the Calgary Stampede. Despite the droughts, and the distances her father had to travel for work, no matter the shortage of new shoes or clothes, Thelma most remembers her parents’ resilience and resourcefulness, their connection to the Indigenous community and their absolute respect for their Métis culture. One of Thelma’s favorite mantras comes from her father, “We are the Métis and we are the best!”. Those early years built within her a solid set of values and real clarity of purpose; Thelma’s sense of self, her love for family, her respect for culture and her fierce work ethic united to create one of the Métis People’s most notable citizens. Thelma Chalifoux. Image courtesy of Sharon Morin. Thelma Chalifoux, seated on the right, with family. Image courtesy of Sharon Morin. Having lived 86 years, Thelma has seen a lot of changes for women, for families and for the larger Métis community. In the 1950’s, an era in which neither women’s nor Indigenous rights were given much space in the national mindset, Thelma left an unhealthy relationship to create a new life for herself and her children. In many ways, not to minimize Thelma’s later accomplishments, this act could be viewed as her most brave and is certainly testament to her greatness as a matriarch. Motherhood has many roles and responsibilities, it is never-ending, selfless and fraught with a myriad of energy depleting duties. Her faith in God and her personal strength are what kept Thelma going during those years of single parenthood, but it was her connection to the Métis community that allowed her to thrive. Friendship has always meant a lot to Thelma as she has never liked doing things alone, her sensibility is that people are best served by many hands and minds. 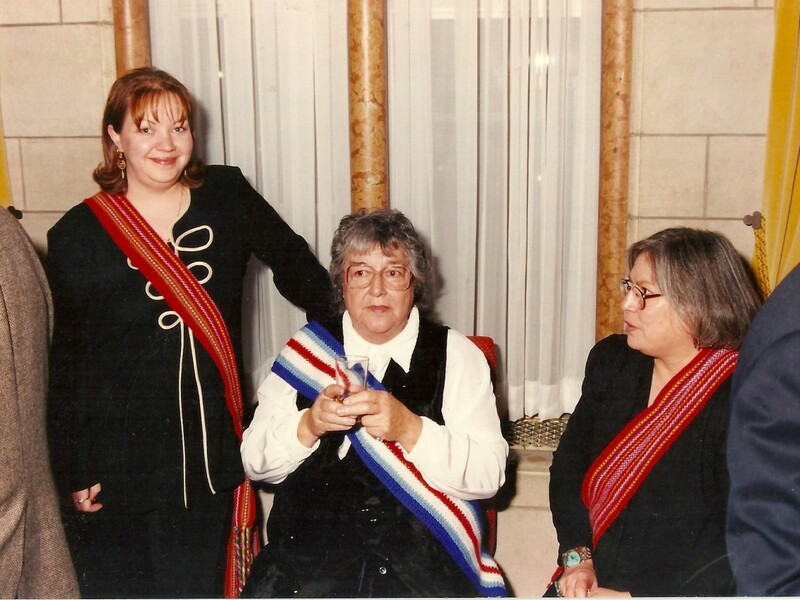 Her circle of lifelong friendships with other steadfast women have produced a myriad of organizations that continue to serve the Métis and First Nations community. By the grace of God and the goodness of others, including her older children who kept an eye on the little ones while she worked, Thelma was able to keep food on the table and a roof over their heads. Because she knows, firsthand, the struggles people experience, Thelma has always worked for the betterment of others. She is a mother, a friend and an advocate for the voiceless. Thelma Chalifoux. seated on the right, and family. Image courtesy of Sharon Morin. Amongst her many accomplishments, Thelma is a founding member of The Slave Lake Native Friendship Centre and the Michif Cultural Institute in St. Albert. She was the the first Métis woman to receive the National Aboriginal Achievement Award and the first Métis and first Aboriginal woman to be appointed to the Senate of Canada. The world can be a daunting and cruel place, a place of coldness and apathy. When life gets to be too much, people need somewhere to rest, someone to lean upon. Thelma Chalifoux is so much more than a person, she is a woman of tremendous tenacity and boundless compassion, a venerable sacred place where others may find solace. If asked to describe her greatest accomplishment, it is doubtful that Thelma would list off her lengthy resume, but rather, she is more likely to say that her success lives in her children and grandchildren, her broad circle of friends and allies, and, in her deep connection to the Métis community. This is the house that Thelma built for us, this is the home where our hearts may find sanctuary. A house of strength and compassion, a home filled with light, faith and laughter and hope.